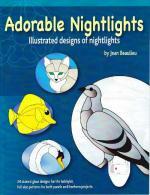 24 patterns of...well..adorable nightlights. Designs include dove, patriotic eagle, kitties, swan, butterflies, flowers, moth, pigeon, fish, mouse, pelican, blue jay, albatross, hummingbirds, rooster, and a rose coat of arms. Each pattern is shown in full color and color suggestions are included. Designs can also be used in panels and free-form projects. From delicate dogwood blossoms to hardy oak and maple leaves, this collection of stained glass lampshade patterns offers beautiful but not overly detailed designs. The four-sided panel-construction shades feature motifs that flow in a continuous fashion to form an overall pattern. Simple yet elegant patterns include foil overlays that add a special flair to the designs, which use standard-size vase caps that can be resized for a variety of bases. 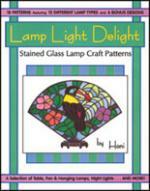 Contains 16 new full-size patterns for lampshades, many of which feature straight line bevels. Projects vary in difficulty to satisfy both the beginning and professional craftsperson. Basic lamp construction techniques are outlined in the GLASS CLASS section and many tricks of the trade are offered throughout this book. Each pattern is supplied with all the information you need to construct the project. The distinctive glow of light and color given off by stained glass lampshades adds warmth and beauty to any decor. Now you can make your own exquisite shades with this versatile collection of 46 full-size patterns that range from traditional and Art Nouveau to contemporary styles. Looking for new projects to make in your kiln? 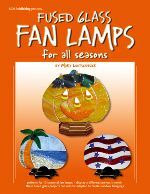 This book contains patterns for a dozen colorful projects that can be used as "fan lamps" or hung in the window as suncatchers. With 12 holiday and seasonal designs, you can display your creations for a month at a time and change them with the seasons. Tips and hints are included for creating these fused glass projects, but basic fusing techniques are expected. 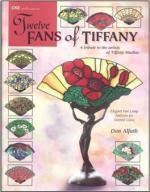 Contains 36 pages of patterns for window treatments, fanscapes and night lights. 3 sections of patterns: From the Sea (sea horses, shell, jellyfish), From the Garden (violets, daffodils, tulips, morning glories), and From the Sky (herons, hummingbirds, butterflies, birds). Contains 12 different lamp types and 6 suncatchers that reflect the style, grace, color and warmth of life in tropical southwest Florida. Choose from a selection of versatile table lamps, fan lamps, hanging lamps, night lights and a lamp planter. Themes include a floral scene, a yellow Lab, a Toucan, a pineapple, a Kitty Cat, some angels. All patterns are full size color and are great for beginners or experts. These shapes are eclectic yet tasteful and will add a great note of character and interest to any decor. The designs are inspired by a blend of arts and crafts motifs with modern, mid-century lava lamp stylings. The result is decorative lighting that is geometric and sculptural, yet tempered with sensitive line and detail. 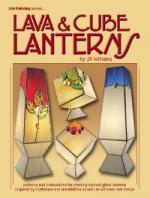 Includes full-size patterns and instructions for 12 lanterns. Adding the electric to the lantern is made easy with instructions and clear illustrations. 25 full-size lampshade designs that range from small night-stand styles, elaborate dining room swags, wall sconces with matching swag lamps to 3 of the most popular inverted ceiling style shades. The majority are medium size shades, many of which are suitable for either swag or lampbase applications. The 25 lampshade patterns are for 8" to 21" diameter shades. Styles include minis, inverted ceilings, wall sconces, and tables swags. 18 full size Prairie style patterns for 12" square Prairie lamp shades. Designs match certain windows in "Prairie Designs" book. Instructions included for enlarging to 14" and 16" shades. If you are attracted to the clean lines and elegant simplicity that were the hallmark of the Prairie School of designers of the early 1900's, you'll enjoy these lamp projects. Full-size patterns for five lampshades and four hanging lanterns are included. Three of the designs allow you to make matching lamp and lantern sets. Because the geometric designs consist of only straight lines, even the inexperienced crafter can successfully complete these projects. 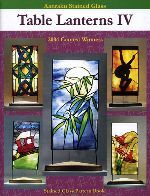 Features 25 designs from the results of the 2004 Table Lantern Design Contest. Themes include are florals, bamboo, geometric, pets, Celtic, landscapes, and more. Wiring kit available and sold separating. Color photographs and assembly instructions included. 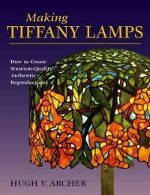 Create beautiful stained glass fan lamps based on original Tiffany lamp designs. Choose from autumn leaves, clematis, dogwood, pansy, acorn, Roman shade, standard globe, poppy, daffodil, dragonfly, peony, or the 3-D golden lotus leaf. 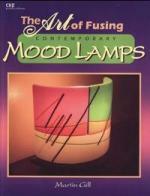 All lamps are shown in color pictures and include detailed, illustrated instructions.